June was an amazing month for the MakerBus team. The MakerBus team was invited to help run a summer children’s maker camp in beautiful Victoria British Columbia by the organizers of the Digital Humanities Summer Institute (DHSI). 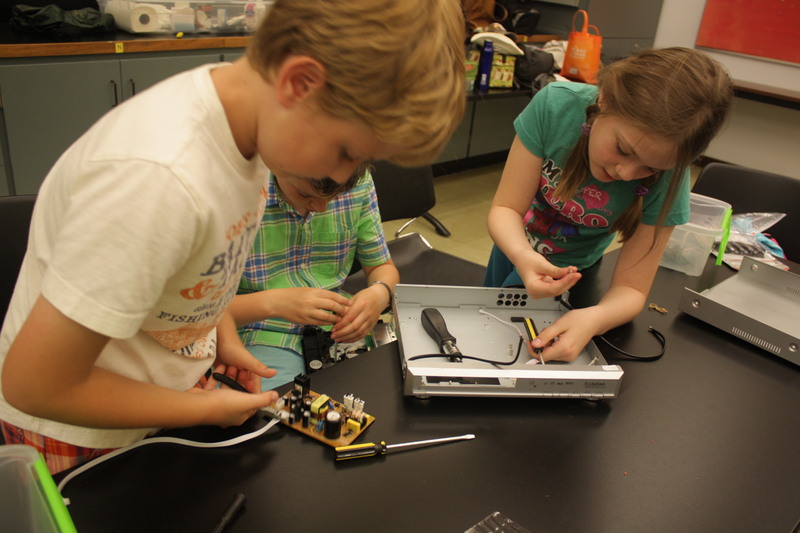 Working with Eurekamp (an inquiry-based children’s camp from the University of Alberta), the MakerBus team co-developed MakeU – a week-long summer camp that blended philosophy and making. This was an amazing experience for a number of reasons. First, we got to spend a week with 6 of the coolest children any camp could ever ask for. Second, our team got to travel to Victoria (Ryan’s hometown and Kim and Beth’s home-away-from-home). Third, we met Warren – a passionate, energetic, and all-round amazing camp councillor from Eurekamp. The week flew by and before we knew it, we were saying goodbye to our new camp friends. We blogged about the experience extensively – check out our June archives for all the memories. After we came back from Victoria, we had to hit the ground running to prepare for our summer project to visit every library branch in London as part of the TD Summer Reading Program. Between July and August we ran two-hour educational events at 15 different library branches. Massive thanks to everyone who helped us with these visits: James, Herta, Tony, Alan, Sinead, Titus, and Paul we invaluable in their help. Our bus runs on community support and we couldn’t do it without you. The library visits were a great opportunity to get out into the community and share our love of making with Londoners. Over the course of our 15 visits, we had more than 500 people participate in our educational activities. We work with a great charity called Literacy Link South Central (LLSC) to design innovative adult literacy courses. Working with Tony and Herta from LLSC we offered a number of different adult literacy pop-ups at literacy providers across London. This was an interesting addition to our mostly child-focused library offerings. Adults bring entirely different perspectives to our modules and really push us focus on our educational objectives. During August we also began planning our biggest event yet – a 10-day event at the 2014 Western Fair. Western Fair is a huge supporter of the work we do and they invited us to launch a fundraiser at our fair. While this was a great opportunity, it also posed a huge challenge – what kind of activity would we run that tens of thousands of people would find both enjoyable and educational? 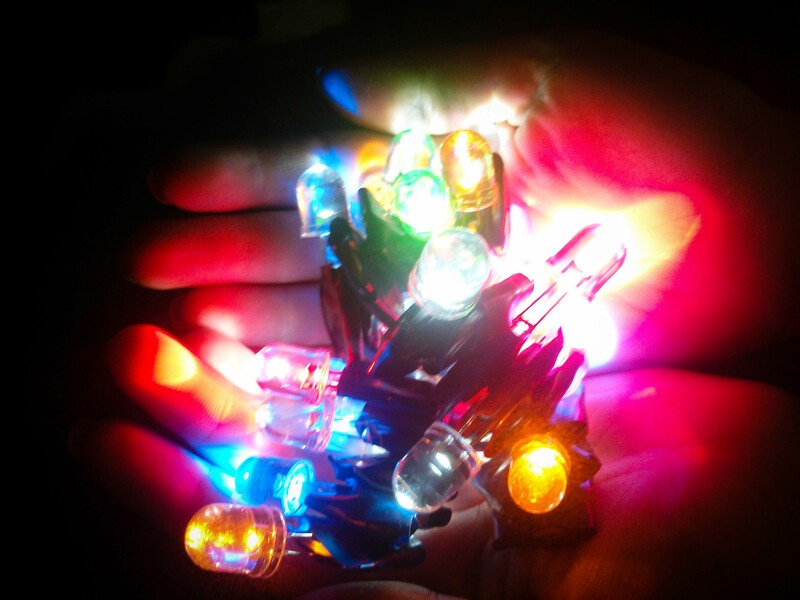 We ended up settling on building LED throwies – tiny, super-bright, magnetic lights than can be assembled from every-day items and can be used to light up any metallic object. During August Ryan decided that it was long overdue to learn how to drive the MakerBus. Having only driven a standard transmission vehicle once in his life, Ryan (with the mentorship of Alpine Systems Engineering’s Paul Graham) began learning how to drive the MakerBus. Boy did we make a lot of throwies at the Western Fair! We ordered enough materials to make 5,000 throwies and by the end of the fair we were getting pretty good at making them. For an event this large, we really had to roll out the big guns and invite every member of our ever-expanding pool of volunteers. Giant, West Fair-sized thanks to Fred, Effie, Henry, Dave, James, Richie, Alan, Bryan, Sinead, Tony, Herta, James, Kristina, and John. Getting to spend 10 days with this amazing group of people made the 13 hours days worth while. We met thousands of Londoners during the fair and shared laughs, stimulating conversations, and 3D printed joy. Even with our 10 day stint at Western Fair our team still found time to run a pop-up at the Hamilton Road Community Festival, launch the first MAKE History at the Old East Village Heritage Day, and run a couple of cultural events with Literacy Links South Central. In October we were invited by the Southern Ontario Library Service to run a series of librarian training workshops around Southern Ontario discussing how best to bring makerspaces into libraries. Kim, Ryan, and Sinead from Unlondon had the pleasure of travelling around our fine province, meeting librarians who are passionate about fostering community creative. At the end of October we brought the bus to Halloween in Old South Village. We parked the MakerBus beside the Landon Library Branch and showed children of all ages how to make non-toxic slime. By the end of our visit, it looked like a scene from Ghostbusters II. In October we were also invited by the organizers of Wordsfest to run the creative portion of the weekend-long festival of all-things literary. Kim spearheaded a day of unbounded creativity at Museum London, showing people how to make book pinwheels, word art, and up-cycled book purses. Massive thanks to Leslie for bringing her amazing students to run the book purse workshop! 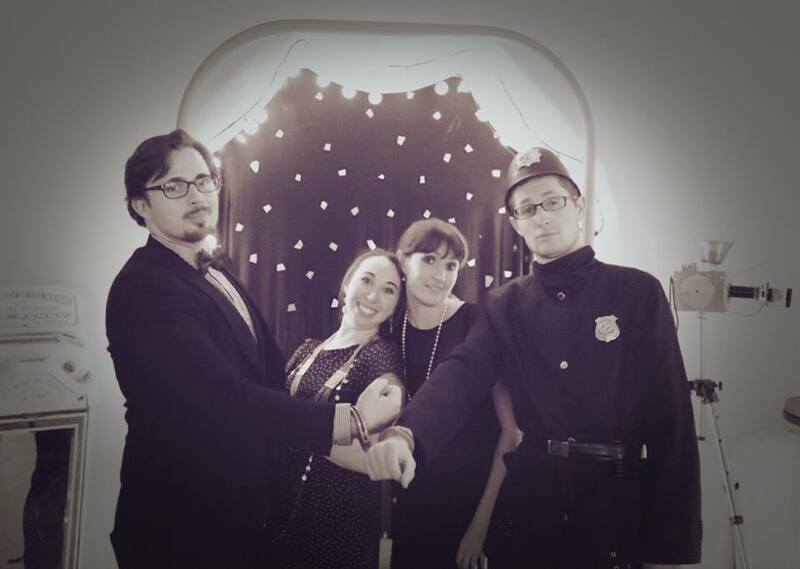 On the final night of Wordsfest our team ran the after party – a one-of-a-kind 1920’s style speakeasy called the Blind Pig. This happening juice joint was held in VibraFusion Labs at 355 Clarence St. Guys and dolls sported this flapper finest and we listened to amazing music from an Ontario band called the Vaudevillian. This event was a huge success and we have the hard work of Dave, David, Leslie, Allison, and many others to thank. November was the final month of MakerBus activities before our team took some much needed rest in December. We decided to go out with a bang by holding a 24-hour Make-a-thon. David Bobier of VibraFusion Labs (who is an absolutely wonderful person) agreed to let us run our event inside of his lab. We planned the Make-a-thon for two reasons. First, we wanted to help raise money to support the robotics team at St Teresa’s Catholic School. This hard-working team reached out to us for help raising money and we wanted to find a fun way to help them. Second, the Mythbusters were going to be in London performing a show than night and we hoped we might attract these high-profile advocates of the maker movement to our event. First of all I’d like to thank the robotics team for staying as long as they could (it was a school night after all) and showing us their amazing robotic creations. Secondly I’d like to thank everyone who was crazy event to join Ryan, Beth, James, and Kim for the full 24 hours. Thank you Dave and Kristina for your support. During our night we made 100 mittens out of recycled sweaters which we later donated to My Sister’s Place. James got his teletype machine up and tweeting. Dave completed an insane number of projects. And the MakerBus team finished making their Christmas cards. It was an unforgettable, if exhausting, night. Also in November we participated in the Old South Christmas celebrations and ran a 3D printing workshop at the Masonville Library. Shout out to an awesome local company called Tech Alley for lending us their 3D printing pen for our workshop. We had an awesome holiday surprise to finish our year – we won 2nd place in the Resonant Solutions 10K Holiday Giveaway. We entered the competition with only an hour left in the voting round and our amazing community managed to get us enough votes to make it to the finals. The Resonant Solutions judges liked our video and entry so much that we were awarded second place – THANK YOU! This prize is going to be used to help jump start project development in 2015. Re-reading this post reminded us of a bunch of memories we forgot to include. From Mantis Fest, to our Investing in Children pop-ups, we apologize if we forgot to include anyone. Our deepest thanks go out to every single person who supported us in 2014. Our community made this year possible and with your help we’re looking forward to an even more amazing 2015. Wishing everyone a safe and happy New Year – see you soon London!